New York Mets' Daniel Murphy reacts after missing a ball hit by Kansas City Royals' Mike Moustakas during the eighth inning of Game 4 of the Major League Baseball World Series Saturday, Oct. 31, 2015, in New York. The Royals won 5-3 to take a 3-1 lead in the series. Second baseman Daniel Murphy's error on Eric Hosmer's grounder in the eighth inning keyed yet another comeback for the tenacious Royals, and Kansas City startled the New York Mets 5-3 Saturday night to take 3-1 lead in the best-of-seven matchup. 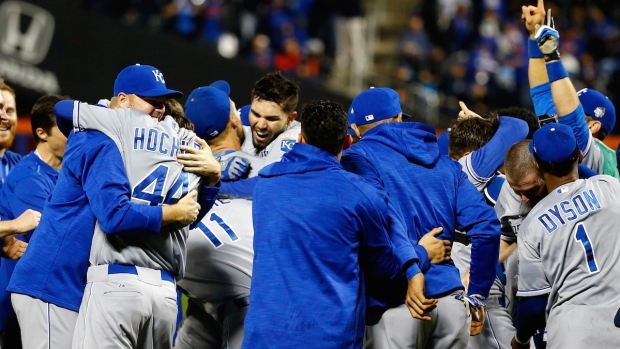 "What they did tonight, is what they've been doing the whole playoffs," Royals manager Ned Yost said. "It's a group of guys that have the utmost confidence in themselves. I don't think at any point these guys thought that they were going to lose tonight," he said. Seemingly spooked by the raucous New York crowd early on Halloween, the Royals rallied for the seventh time in 10 postseason victories this year, this one from a 3-2 deficit. Rookie Michael Conforto homered twice as the Mets built their lead, helped when right fielder Alex Rios lost track of the outs on a sacrifice fly. 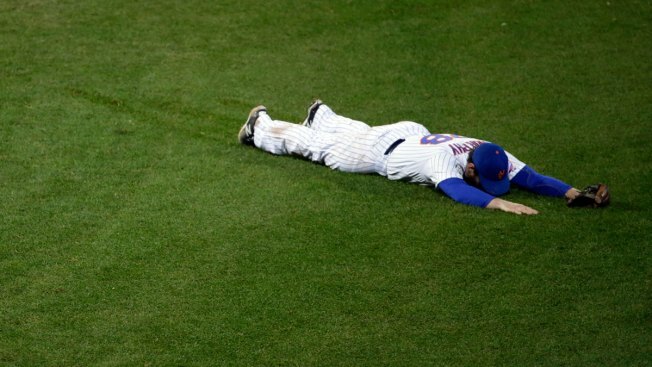 "We certainly talked about it before, they truly don't ever stop," Mets manager Terry Collins said. "In postseason, you can't give away outs. You've got to make outs. You can't give good teams opportunities to score extra runs, because they can do it," Collins said. Alcides Escobar started off this game much the same way he has all postseason — with a hit — albeit on the fourth pitch from Mets hometown rookie Steven Matz. The Mets had about as much success against former teammate Chris Young for the first couple of innings as they had in Game 1, when the 6-foot-10 Princeton grad held them hitless for the final three innings of the Royals' 14-inning win. Wilmer Flores singled, advanced to second on Young's 55-foot pitch in the dirt and went to third on Matz's sacrifice. Curtis Granderson lifted a fly to shallow right and Rios caught the ball. But he took several steps toward the dugout — thinking three outs, maybe — before realizing Flores was tagging up. Rios' throw was late, the Mets led 2-0, and Rios stood frozen with a hand on his hip in right field. Things took a turn for Kansas City — didn't it always seem to this October? — when Alex Gordon singled home Perez in the fifth to get a run back. In a curious move, Collins allowed Matz, making his first World Series start, to go bat in the fifth and come out for the sixth after struggling his previous inning. Zobrist opened the inning with his record-tying eighth postseason double and scored on Lorenzo Cain's single. That chased Matz, who spent the night at his childhood home and then handed out some Halloween candy to neighborhood kids before making the 50-mile commute to work. Jonathon Niese got two outs as Cain advanced to third. Bartolo Colon then set Citi Field into a frenzy by striking out Perez with a wicked slider to end a 10-pitch at-bat.